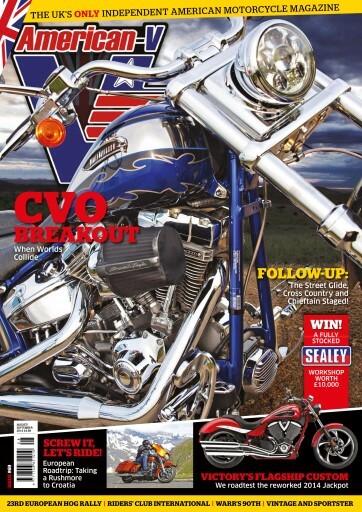 •	2014 Harley-Davidson’s CVO Breakout roadtested: 110 cubic inches of Twin Cam, 110 square inches of chrome and 110 inches of shredded rubber. •	Warr’s Harley-Davidson's 90th Anniversary: Nine decades, three generations, one manufacturer. •	Rushmore in the Alps: Harley’s revamped tourers carve a name for themselves on the Grossglockner Pass. •	Vintage and Sportster: Chillin’ at an old school reunion . •	2014 Victory Jackpot roadtested: the fat-tyred flagship of the Victory fleet grows up and dresses down: it’s still got a 250 back tyre though! •	Teutonic Goth: Pointy, dark one-time Softail Slim from the Thunderbike crew. •	Croatia Harley-Days: kicking-back on the Adriatic Coast for the 23rd European HOG Rally. •	180-Degree V-Twin? Milwaukee’s heavyweight boxer, the 1941 XA. •	Roundhead’s Revenge: dropping in on an event that has successfully gone back to its roots. •	Staging the Street Glide, Cross Country and Chieftain – a follow-up: taking things just a little bit further. •	Shaw’s XR1200TT: Road Racing XR proves that a full fairing can suit a Harley. •	The Lakes Rally: the Riders’ Club International hits Kirby Lonsdale. •	Made In Scotland From Girders: Cat’s first Harley chop after a lifetime on Japs. •	Watch The Birdie: the HDRCGB restage a photograph from their archives. •	Why Waterproofs Aren’t: and it’s all your fault.